Service is our strength and remains a priority for us : our team works tirelessly to provide you the best possible service to repair or to do the maintenance of your crane or lifting equipments. Our technicians are trained continuously to respond effectively and to minimize the downtime of your equipment in case of down time. At our modern facilities, we have all the tools, all the replacement parts and have the skilled workforce to respond effectively and quickly. We also offer an on-road crane or lifting equipment repair service for emergencies. 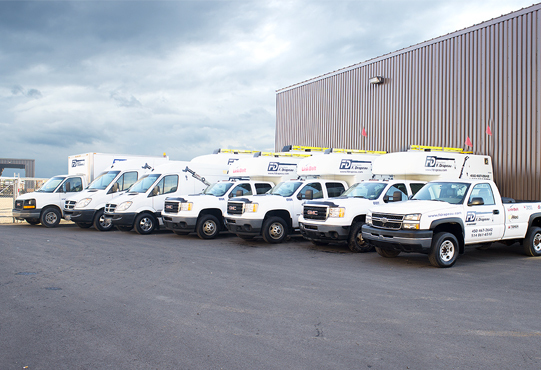 Our many service units can go anywhere in Quebec. Contact us for a quote or to book an appointment! ensuring the professionalism your projects deserve. No matter the brand or the model, we can repair and built according to the requirements of the manufacturers and this, for all type of equipment: railway, manbasket, telehandlers, cab, traditional cranes, telescopic cranes, tower cranes, intermediate sections, jib, boom trucks, etc. Our parts inventory os one of the largest in Canada; we will meet your needs. Do not hesitate to contact us to check availability of parts. We can ship your order within 24 hours in most areas. At Drapeau Corporation, our clientele is precious and we work relentlessly with the aim of offering the best possible service.